Preserving the best from each era and consistently capturing the signs of the times: such is the infinitely delicate responsibility of the designers, master-watchmakers, engineers and artisans of Vacheron Constantin, as they shape creations destined to generate emotions as enduring as those aroused by the discovery of the first pocket watch made by Jean-Marc Vacheron and dated circa 1755. 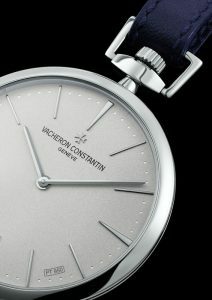 All of which means that today’s creations from Vacheron Constantin – worthy heirs to a proud legacy and tradition – continue to offer devotees of fine watches a deliberately classical style of contemporary elegance. Since its origins in 1755, the year it was founded, the very soul of Vacheron Constantin has been permeated by the famous credo of its quest for excellence. The face will always reflect the soul, and the soul will always enshrine the timeless beauty of the face. This ageless secret is embodied in each creation by Vacheron Constantin. The pocket watch was originally created to facilitate people’s daily lives. They no longer needed to listen to the church bells or to check the clock at home or in the office in order to know the time. For the very first time, a powerful symbol of prestige as well as freedom, a watch followed its owner every where and became a source of inspiration for watchmakers who were able to use their know-how in making ever smaller movements designed to facilitate their use. In the same way, while initially considered as vulnerable, pocket watches only remained so until technological breakthroughs enhanced their protection. Today, they can be made as watertight, accurate and user-friendly as wristwatches. These days everyone has pockets, which was not necessarily the case in days gone by, so there is now nothing to prevent someone indulging in this delightful folly. Vacheron Constantin is revisiting its past and the golden age of the pocket watch by presenting a model featuring a pure, classic and timeless design, belonging to the Collection Excellence Platine and thus necessarily rare because issued in an extremely limited edition. In a decidedly modern twist, the pocket watch is promoted to the status of a beautiful and iconic object in its own right. Whether nestling in a pocket, hung around the neck or placed as a table-clock on a desk, it represents a wish to look at time differently rather than simply wearing it on the wrist. A completely different gesture… Holding a precious pocket watch in the palm of your hand, in order to take time to look at the time on its dial, has once again become an infinitely elegant gesture. A keen awareness of passing time… A pocket watch is also a means of gaining another grip on time: it is held in the hand and thus offers another perception of time, involving a genuine feeling of reappropriating the moment in hand. 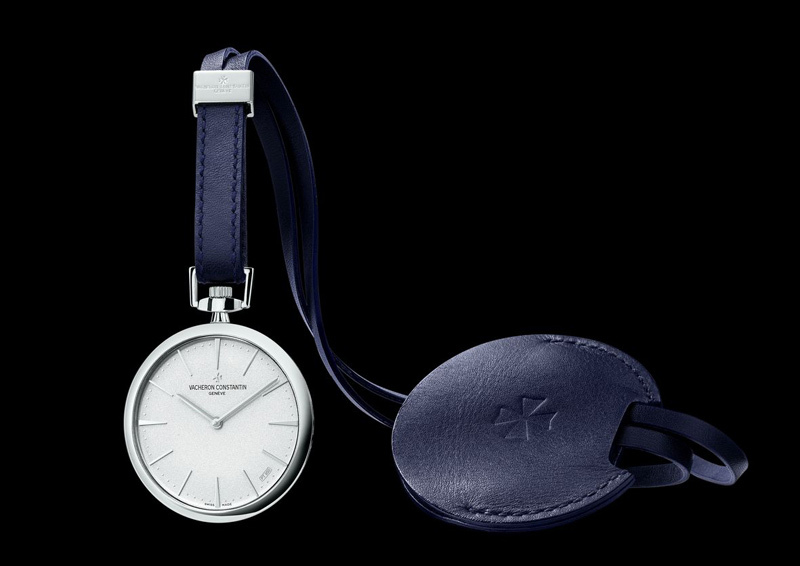 A multi-sensorial object…Released at last from the wrist and presented in a playful form thanks to its pouch and its leather cord or platinum chain, the pocket watch appeals to a variety of senses through its tactile, visual and auditory qualities. Harmonious shapes creating a perfect balance between exterior and interior perfection. 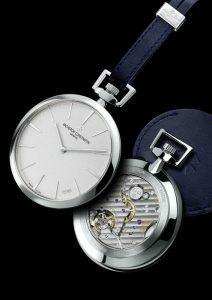 For this first pocket watch in the Patrimony line, Vacheron Constantin once again offers devotees of fine watches the simplicity and elegance of a naturally classical style. The Patrimony Contemporaine pocket watch created by Vacheron Constantin – issued in a limited edition of 50 individually numbered watches available exclusively in the Collection Excellence Platine – reflects a desire guided by the excellence of time-honoured expertise. A voluptuously curved yet elegantly slender case in 950 platinum; a broad, beautifully restrained 950 platinum dial with a finely grained sandblasted finish reflecting the light with a gentle glow such as only platinum can offer; as well as 950 platinum baton-shaped hands gliding over delicately applied understated hour-markers: the exquisite metallic harmony of this creation contributes to its overall aesthetic equilibrium. Inside this elegant exterior beats Calibre 4400, the new mechanical hand-wound mechanism representing the latest generation of proprietary movements and entirely designed, developed and crafted by Vacheron Constantin according to the highest standards of Geneva’s Grand watchmaking tradition. Its generous 28.50 mm diameter, magnified by the transparency of the sapphire crystal back, is perfectly suited to the equally liberally sized 43 mm case. Thanks to its large barrel, this calibre driving the solitary hour and minute hands is endowed with around 65 hours’ power reserve, corresponding to three full days. And since Vacheron Constantin consistently matches such understated simplicity with exceptional finishing, Calibre 4400 proudly bears the prestigious Hallmark of Geneva. The Patrimony Contemporaine pocket watch Collection Excellence Platine thus embodies a philosophy that has remained unchanged through 250 years of history, experience and expertise: an obsession for perfection at each stage in the conception of a watch, and in each and every second of the life of the person it so faithfully accompanies. The obvious choice of precious metal when only the best or the most exclusive will do, platinum has inspired Vacheron Constantin to create its Collection Excellence Platine Limited Editions, in tribute to the distinctive properties and assets of this rare metal. Long considered the exclusive preserve of royalty and statesmen, now joined by collectors and exceptional individuals with refined tastes, platinum conveys a definite aura of prestige that elicits a sense of kinship among a distinguished elite of discerning connoisseurs. For them, owning a Vacheron Constantin timepiece from the Collection Excellence Platine grants them privileged access to one of the world’s most exclusive circles. Each new and necessarily limited-edition Vacheron Constantin model identified as belonging to the Collection Excellence Platine features a solid platinum dial discreetly bearing the inscription “PT950”, along with platinum hands, case and crown, and is housed within a grey lacquered ashwood presentation box. Vacheron Constantin watchmakers first began using platinum in 1820, and the Geneva-based manufacture has since employed this precious metal in many of its most complex and original creations. While 18-carat gold contains just 75% of the precious metal, platinum is 95% pure. Also much rarer than gold, it is found in an extremely small number of deposits worldwide, mainly in South Africa. Its density and its weight are far superior to other metals and make it a more durable material. This quality means that a tiny scratch on a platinum model merely displaces the metal, engendering only a minimal loss of material. An object in platinum therefore retains its full value, as befits a token of eternity. Moreover, it is not subject to oxidation and is thus not affected by the passing of time, making it a perfect lifelong companion. In addition to its resistance and its density, platinum boasts another remarkable quality: its extreme malleability. It is indeed malleable to the point where a single gram of metal can be drawn out to form a thread stretching almost two kilometres. Vacheron Constantin created the Collection Excellence Platine specifically in order to highlight the distinctive qualities of this noble metal.